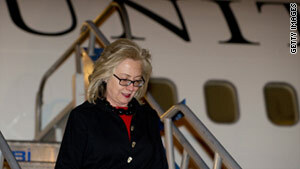 Secretary of State Hillary Clinton's 12-day overseas trip started Friday in Istanbul, Turkey. Washington (CNN) -- Secretary of State Hillary Clinton arrived Friday in Istanbul, the start of a 12-day journey that, in typical Hillary fashion, will straddle the globe, taking her to Europe, India and East Asia. The main event in Istanbul Friday is the Libya Contact Group. With the noose around Moammar Gadhafi continuing to tighten, the international community is intensifying its planning for the post-Gadhafi era. A major part of that is working the Libyan Transitional National Council, and preparing them to be an interim government after Gadhafi falls, until Libyans can hold elections. The head of the TNC Mahmoud Jabril will brief the group on the TNC's roadmap for a democratic Libya. The conference will be looking at what kind of support the Libyans will need from the international community to run the country and the role the United Nations can play in the transition. The international community isn't expected to fully recognize the TNC as an official government yet. While the TNC has impressed many with its plans so far, it is unclear how much support it has throughout the country and needs to demonstrate that it is including a wide variety of Libyans from all geographic regions and tribes. While in Istanbul, Clinton will also meet with President Abdullah Gul, Prime Minister Recep Tayyip Erdogan and Foreign Minister Ahmed Davutoglu. There have been some disagreements with Turkey, in particular over Turkish ambitions to be a mediator between Iran and the international community over its nuclear program and the Gaza flotilla, in which Turkish nationals were killed by Israeli troops. But in the last year the relationship between Washington and Ankara has improved dramatically and, U.S. officials would argue, is in a pretty strong place. There are few major international issues where Turkey and the United States are not working closely together, such as the uprisings in North Africa and the Middle East, Afghanistan, counterterrorism, energy and the global economy. In addition to doing a post-mortem on the Libyan meeting, Clinton's meetings in Turkey are expected to focus a lot on Syria. There are currently about 9,000 Syrian refugees in Turkey. And Erdogan has gradually been stepping up the pressure on President Bashar al-Assad. They will also have a discussion about missile defense. The new NATO missile defense system will involve radar systems and Turkey is one of the countries under consideration. From Istanbul Clinton heads to Greece, where she will meet with Prime Minister George Papandreoou and other political leaders. Greece is in the middle of a serious financial crisis, which has been accompanied by riots and unrest. Clinton wants to talk to Greek leaders about the government's plans to get the economy back on its feet and how the U.S. can help. In New Delhi, Clinton will take part in the India-U.S. Strategic Dialogue, in which the world's two largest democracies will discuss all aspects of their cooperation, including defense, energy, science and climate change. Her trip to Delhi comes on the heels of the latest Mumbai attacks, in which three bomb blasts killed 21 people, so she will be showing U.S. support but also talking about how the two nations can strengthen their joint counterterrorism efforts. India's role in Afghanistan and its longstanding tensions with neighboring Pakistan will be high on the agenda, and Clinton will be discussing both how India can play a role in Afghanistan's political transition and the importance of improving relations with Pakistan. Clinton also will stop in Chennai, the first U.S. secretary of state to do so. The economic component to the nations' relationship has been growing exponentially, and the city of Chennai has emerged as a hub for trade and U.S. investment. Clinton is then on to Bali, Indonesia, for meetings with East Asian leaders and the Southeast Asian bloc countries of ASEAN. The Obama administration has been cozying up to the ASEAN countries for the past few years. In part, it's a way to counter China's rising influence in Asia, and there is likely to be intense discussion about China's ambitions to dominate the waters of the South China Sea. But Southeast Asia is another region that has huge economic potential for the United States. When Clinton travels to Hong Kong, she will deliver some remarks about the desire to strengthen U.S. economic leadership in Asia. The last stop may be the toughest. Clinton finishes is Shenzhen, China, where she will meet with China State Counselor Dai Bingguo, a big player in the Chinese leadership. North Korea will be on the agenda, as it will be in Bali, but I suspect Clinton will have a good deal of post-Bali damage control over the barbs likely to be thrown at China during the ASEAN meeting. Dai is famous for his tirades with Clinton when China is mad with the United States. Her aides say she can handle it. She gives as good as she gets with the Chinese, they tell me. And Dai is no exception.